Obituary – Lewellen, Helen Marie (Neal) « Perry High School Alumni Association, Inc.
– 17 year old daughter of Mr. and Mrs. Roy Neal, 1019 Sixth street. She was born August 17, 1922 in Perry. In 1936 and 1937 she was a member of the high school girls` glee club and she took part in both the junior class and senior class play. During her senior year she was selected for membership to the National Honor Society and for two years she has been a member of the student council. She has also been a Red Hot for six years, serving as secretary, reporter and yell leader. Helen Marie is an active member of the Order of Rainbow for Girls. 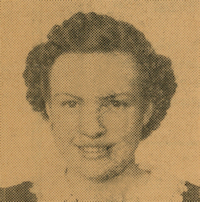 She was secretary of her home room class in 1938-39 and vice president of the home room class in 1939-40 as well as being vice-president of the senior class. Her hobbies are collecting match books and keeping a scrap book. Next year she plans to attend Hills Business University in Oklahoma City taking a commercial course in order to become a secretary or stenographer. Helen Marie Lewellen, 69, 1413 Country Club drive, died at 4 a.m. Wednesday, Dec. 4, 1991, at Perry Memorial hospital. Funeral will be at 10 a.m. Saturday at Calvary Baptist church with Rev. W. T. Dunn, the church pastor, and Rev. Sam Davison, of­ficiating. Burial will be at Grace Hill cemetery under direction of Brown Funeral home. Memorials may be made to the Oklahoma Medical Research Foundation earmarked for heart research. Mrs. Lewellen was born at Perry, Aug. 17, 1922. Her parents were Roy and Nina Neal. She was a 1940 graduate of Perry high school and married Jack Lewellen on Feb. 14, 1943. She had been employed at the Donahue & Mugler Insurance Agency. She was a member of Calvary Baptist church, Royal Neighbors of America and Senior Home Culture club. In addition to her hus­band, of the home, survivors include one daughter, San­dra Kay Davison, Oklahoma City; two sons, Colin Lewel­len and Kelly Lewellen, both of Perry; six grandchildren and one great granddaughter.